For other uses, see Angostura (disambiguation). Emperor Franz Joseph I of Austria is shown on the label, since Angostura won a medal at the 1873 World Fair in Vienna. Angostura bitters (English pronunciation: /æŋɡəˈstjʊərə/) is a concentrated bitters, or botanically infused alcoholic mixture, made of water, 44.7% ethanol, gentian, herbs and spices, by House of Angostura in Trinidad and Tobago. It is typically used for flavouring beverages or (less often) food. 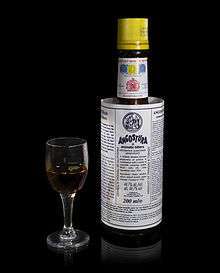 The bitters were first produced in the town of Angostura (Ciudad Bolívar, Venezuela) (hence the name), and do not contain angostura bark. The bottle is easily recognisable by its distinctive oversized label. The recipe was developed as a tonic by a German, Johann Gottlieb Benjamin Siegert (1796–1870), surgeon general in Simón Bolívar's army in Venezuela. Siegert began to sell it in 1824 and established a distillery for the purpose in 1830. Siegert was based in the town of Angostura, now Ciudad Bolívar, and used locally available ingredients, perhaps aided by botanical knowledge of the local Amerindians. The product was sold abroad from 1853 and in 1875 the plant was moved from Ciudad Bolivar to Port of Spain, Trinidad, where it remains. Angostura won a medal at the Weltausstellung 1873 Wien. The medal is still depicted on the oversized label, along with reverse which shows Emperor Franz Joseph I of Austria in profile. The exact formula is a closely guarded secret, with only five people knowing the whole recipe. Angostura bitters are extremely concentrated and are an acquired taste; though 44.7% alcohol by volume, bitters are not normally ingested undiluted, but instead are used in small amounts as flavouring. Angostura bitters are a key ingredient in many cocktails. Originally used to help with upset stomachs of the soldiers in the Simón Bolívar army, it later became popular in soda water and was usually served with gin. The mix stuck in the form of a pink gin, and is also used in many other alcoholic cocktails such as long vodka, consisting of vodka, Angostura bitters, and lemonade. In the United States, it is best known for its use in whiskey cocktails: the Old Fashioned, made with whiskey, bitters, sugar, and water, and the Manhattan, made usually with rye whiskey and sweet vermouth. In a Pisco Sour a few drops are sprinkled on top of the foam, both for aroma and decoration. In a Champagne Cocktail a few drops of bitters are added to a sugar cube. Though not in the classic recipe, bartenders sometimes add more flavour to the Mojito cocktail by sprinkling a few drops of Angostura bitter on top. Bitters can also be used in "soft" drinks; a common drink served in Australian and New Zealand pubs is lemon lime and bitters. Angostura Bitters Drink Guide, a promotional booklet of 1908, was reprinted in 2008 with a new introduction by Ross Bolton. Angostura bitters is often incorrectly believed to have poisonous qualities because it is associated with angostura bark (although it does not actually contain any), which, although not toxic, during its use as a medicine was often adulterated by unscrupulous sellers who padded out the sacks of bark with cheaper poisonous Strychnos nux-vomica or copalchi bark. Since 2007, Angostura have also produced Angostura Orange, an orange bitters. There was a shortage of Angostura bitters in 2009; the company reported that this was primarily caused by a problem in their supply of bottles. There were incorrect rumours of a product recall, or that production of the bitters had stopped at the plant in Trinidad. The shortage was the subject of many news articles and blogs, particularly in the cocktail industry. 1 2 Catherine Fallis (2004). Wine. iUniverse. p. 214. ISBN 0-595-32699-4. ↑ Siegert v. Gandolfi et al., reported in The Federal Reporter 149 1907:100ff. ↑ 1830 date given as testimony in Siegert v. Findlater, 1876, reported in N.C. Moak,Reports of Cases Decided by the English Courts: "8. Chancery Division" (Albany, NY, 1880) pp21ff. ↑ Siegert v. Findlater; Siegert v. Gandolfi. ↑ Maddow, Rachel (2010-04-10). "Sweet Bitters". MSNBC. ↑ "A Bitter Medicine Cures the Hiccups". The New York Times. December 31, 1981. ↑ "Bitters: The World's Best Kept Secret (205)" FineLiving.com Archived January 11, 2006, at the Wayback Machine. ↑ "Earthnotes - Herb Library"
↑ Albert Y. Leung, Steven Foster (2003). Encyclopedia of common natural ingredients used in food, drugs, and cosmetics. Wiley-Interscience. p. 35. Wikimedia Commons has media related to Angostura bitters.